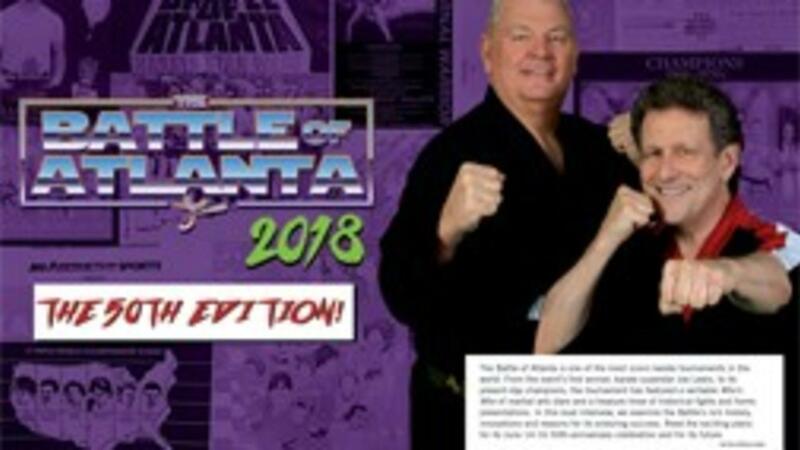 The Battle of Atlanta is one of the most iconic karate tournaments in the world. From the event’s first winner, karate superstar Joe Lewis, to its present-day champions, the tournament has featured a veritable Who’s Who of martial arts stars and a treasure trove of historical fights and forms presentations. In this dual interview, we examine the Battle’s rich history, innovations and reasons for its enduring success. Read the exciting plans for its June 14-16 50th-anniversary celebration and for its future. When you mention the name Battle of Atlanta, for most folks, scenes from the movie Gone with the Wind come to mind. But, five decades ago, in a scene much like one out of an old movie, Atlanta-based nationally rated point fighter Joe Corley decided to rent a school gym and put on a show — the first Battle of Atlanta karate tournament. Half a century later, these grainy black-and-white memories have faded. They’ve been replaced with full-color, high-definition images of what a technically-advanced, modern-day karate tournament should look like. Along the way, “the Battle” or “BOA,” as it came to be known, set more precedents and created more historic milestones than any other major karate tournament in the U.S. The 50th Edition Battle of Atlanta tournament will take place June 14-16, 2018. It reigns as the “go-to” event for karate competitors across the U.S. and internationally. Everyone who is anyone in competitive karate has been there at one time or another. However, to fully understand its continuing impact on the karate world, you should know about its yin and yang, its past and present and its future. To give you the inside story of this epic tourney and what its future holds, MASuccess has been granted unprecedented access to its movers and shakers. In this candid interview, we go one-on-one with both the tournament’s originator, Joe Corley, and its current promoter, Truth Entertainment President Greg Ruth. MARTIAL ARTS SUCCESS: Let’s start with you, Joe Corley. What was the inspirational spark that led to you to create this legendary tournament? JOE CORLEY: Battle cofounder Chris Mcloughlin and I traveled the country, competing in tournaments from Arizona to DC and from Miami to New York. The main thing that we saw and experienced was how much regional bias existed around the country. The bias included favoritism not only to the regional favorites, but also to the fighters and team members of that same organization. Our initial mission was simple: to create an environment where anyone from anywhere could win on any given tournament day. The mandate for our officials was to exercise the kind of fair and impartial judging that one would expect at a martial arts event, where honor and dignity should be paramount. We drew many of the top fighters in the country to Atlanta, the first time that had happened in the Southeast. We were successful in that regard. The word went out that this was a fighters’ tournament, where your training would pay off on tournament day. maSUCCESS: At what point did you know that the BOA had transitioned from a simple karate tournament to the international “go-to” event status it enjoys today? Corley: We held the tournament the first three years in the gymnasium at Oglethorpe University and had the pleasure of having Chuck Norris join us there. Then, in 1973, we moved to the Georgia Tech Colosseum, where Chuck, Mike Stone, Pat Johnson, Bob Wall, Tadashi Yamashita and Mike Foster joined us as head officials. We had 850 competitors on that day and 6,500 spectators. Pat Johnson had devised for us a unique “tournament of champions,” which was executed beautifully. It ended up with Jeff Smith facing Howard Jackson for the grand championship. I would say it was this event that truly catapulted the Battle into the national prominence that it began to appreciate. Its reputation was further enhanced in 1975, when Bill Wallace was kind enough to let me challenge him for the PKA World Middleweight kickboxing title in Atlanta’s Omni, in front of 12,000 fans. In the ensuing years, as a supplement to the regular tournament, kickboxing champions Jeff Smith, Jeff Gripper, Earnest Hart, Jr., Richard Jackson, Paul Vizzio and Brad Hefton fought for ESPN, NBC and CBS at the Battle. We selected high-profile venues, from the Georgia Tech Coliseum where Olympic Boxing was staged, and the 22,000-seat Omni and its replacement, Philips Arena. The 70,000-seat Georgia Dome was home of the Olympics and the Super Bowl, and the World Congress Center. maSUCCESS: Let’s shift to you, Greg. You’ve been around martial arts for 30-plus years. When did you become involved in the BOA and what drew you to become its current driving force? GREG RUTH: I attended my very first Battle in 1988 with my son, Brian, at Georgia Tech. He was competing in only his second national tournament. He won first in fighting that day at the age of 11. I began helping with the Battle as coordinator for the black belt divisions in 2000. However, it was after 9/11 that my passion for the Battle came full circle. The following year, as Joe and I spoke about a tribute at the Battle to all the fallen, honoring New York City Police Commissioner and black belt Bernard Kerik, I knew the Battle was very special to me. The next year, my granddaughter, Mariah, held the flag on stage and my son, Toby, sang Alan Jackson's Where Were You When the World Stopped Turning. I realized then that I wanted to have a much larger role in the Battle. The belief and faith that Joe Corley had in me to carry on his legacy and to preserve the storied history of the Battle is the driving force to carry the torch. The Battle is an icon in all of sport karate. I’m truly blessed to have the opportunity to provide the leadership needed to promote such a great event. maSUCCESS: Joe, over the years, what was the consistent draw that lured in top-notch competitors? Corley: It was the obvious sense of fairness that had been our initial mission. The best fighters in the country would naturally always want to face the other best fighters on a level playing field. Each year, we would see champions from various parts of the country become grand champions, and we truly didn’t have any vested interest in who won. We also invested in having high-profile, highly respected, highly competent officials that the fighters trusted for their fairness. The Tournaments of Champions drew big attention from fighters who aspired to be included and gave them a chance to be in the company of the best competition in the world. I believe there was a long period of great synergy that grew from the efforts of the promotion. From the competence of and confidence in the officials, and from the fighters and their instructor/coaches. It was the best of our American Karate dream.